When I travel by train my goal is not necessarily to “get there”. My goal is to enjoy the entire trip. For me it’s a way to decompress after a busy week, relax with a book or note pad and to take in the scenery. It is complete stress-free travel. So, while in DC I had an idea – it’s not a unique concept, but one I thought might be worth a shot. What if I could find others on my train, the 29 Capitol Limited (westbound) who might be interested in socializing, prior to boarding the train? If, for example, I were to discover that someone from my age group or social demographic were to be on the same train, maybe we could coordinate a dinner time together. Maybe three or four of us (more would be even better) could plan to meet up for a glass of wine in the observation car. With this in mind I created a FaceBook event for my train leaving DC and I sent the invite out via Twitter. I also included @Amtrak in the tweet to see if Amtrak would re-tweet the event. My goal was multifold; first to see who might be attuned to such media, second to see if anyone would join the “event” and lastly, to determine if I might learn something from this. Now certainly just one attempt at an on-line social meet up is not nearly enough evidence to model a media policy, but it is interesting to ponder. To be fair (as one could be) I also downloaded FourSquare, the location-based mobile app that permits it’s users to “check in” at various venues. Using this app I thought I might find some other social media users who might be off the FaceBook grid. While a FaceBook event is rather limited in scope – one would have to know it exists to attend, FourSquare uses existing venues then allows visitors to state that they’re there. There are other such apps such as Gowalla. The experiment attracted no one. Twitter didn’t attract any shout-outs from other passengers on the train and Amtrak didn’t retweet the post. The FaceBook event didn’t add any attendees nor did I find anyone listed on FourSquare who was on my train that day. Is this unusual? Probably not. Amtrak’s passengers tend to be (at least from what I’ve seen) the earliest Boomers who have not grown up with gadgetry, geocoding and multi-media methods of introduction. Perhaps its Amtrak’s Acela service that has a younger, hipper base considering its destinations and frequency. As the Boomer segment of Amtrak’s ridership begins to diminish through attrition, attracting new riders becomes a priority. So… why not leverage the social nature of train travel and “put it out there” into the new interactive world of engagement. Amtrak’s observation cars have service bars in them, though I’ve never seen one staffed. There is however, space for ice and bottled drinks and with the right bar tender, the observation car could take on a nifty air of the cocktail lounge for the rail-riding set. It may be next to impossible for a government agency such as Amtrak to set aside the labor to create a daily roster of departures and “invitations” – or could it be a good idea in the short-term? Enough so to start a trend or enough so that it’s actually a low-cost advertising tool? Enough perhaps, to reintroduce rail travel as an alluring alternative? Could Amtrak benefit by becoming a FourSquare “venue owner”? I’ll continue with my social experiments aboard Amtrak as I travel in the coming months and we’ll see what happens. In all likelihood, I’ll become the Mayor of the Cleveland Amtrak station in no time. Today’s Chicago Tribune announced that United and Continental airlines have agreed to keep the Cleveland hub open for at least five additional years. Earlier this month USA Today stated that Delta airlines will reduce it’s regional jet flying by 50% at it’s Cincinnati-Northern Kentucky hub. Currently Delta’s departures from CVG are down to about 170 flights per day from it’s 2005 high point of 600 daily departures. Understand that I am not an airline analyst nor an economist, but with a former airline background, I have some insight into this industry. What happens at these two hubs, Cleveland and Cincinnati, is going to have a long-term impact on the Ohio economy. 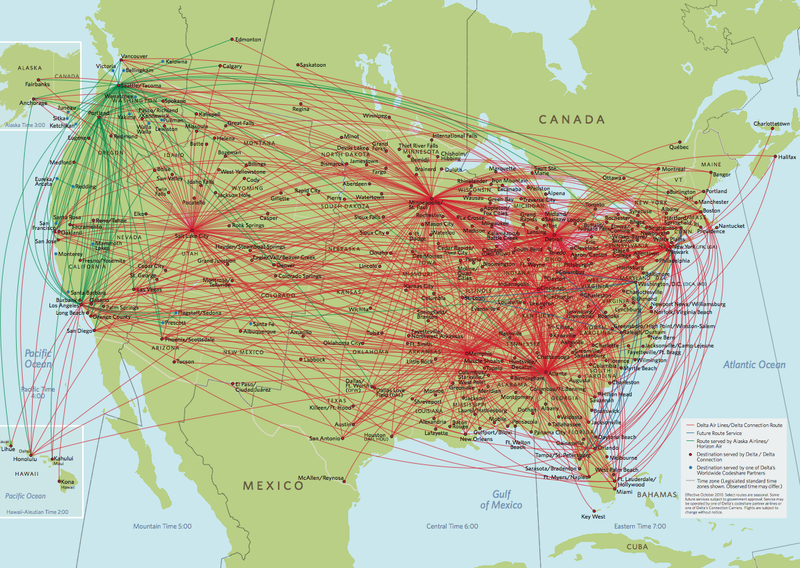 The combined United/Continental will have major hubs at the time of the merger in the following cities: New York, Cleveland, Houston, San Francisco, Los Angles, Denver, Chicago and Washington DC. Merge the maps and route structures and it’s easy to see that Cleveland becomes rather redundant – sandwiched between New York and Chicago. Considering Cleveland’s declining population and lack of industry, it’s not difficult to see the fate of that operation, regardless of what the merged company states. Should the merged company close it’s Cleveland operation it would face a $20 million fine. That’s not a very large amount and it’s conceivable that a $20 million fine is far less than keeping an operation running that isn’t profitable, if in fact that becomes the case. 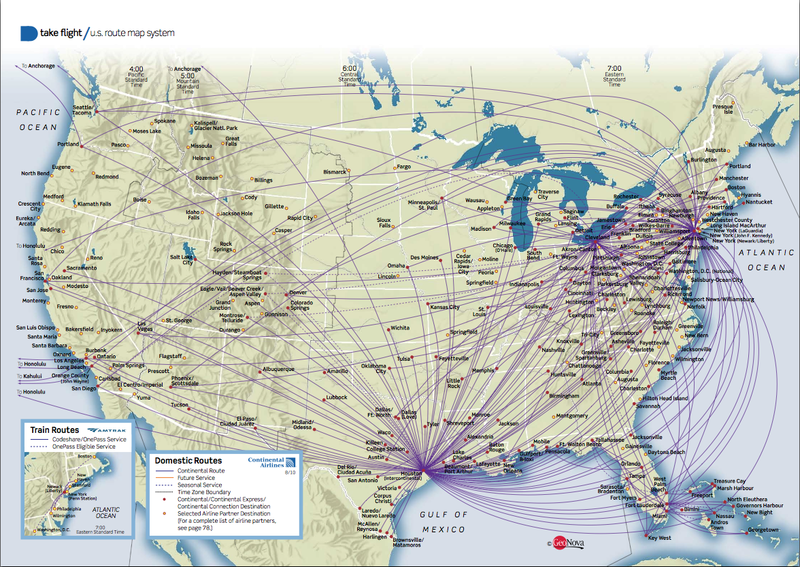 Delta’s merger with Northwest created another integrated hub system that includes Los Angles, Salt Lake, Seattle, Cincinnati, Minneapolis, Detroit, Atlanta, Memphis and New York, This merged map puts Cincinnati right in the middle of two of it’s largest hubs, Detroit and Atlanta. Detroit’s economic conditions would seem to make it a logical choice for reduction, but it’s sheer size may give it a certain momentum. The Cincinnati, hub, however has already been reduced by nearly 60% which will further diminish it’s competitive ability. Airline hubs bring in lots of money to their associated cities. Flight attendant, pilot, mechanic and ground crews are based and scheduled from these hubs. Associated jobs in services sprout up around these airports to support the stop-over traffic. Hotels, restaurants and car rentals to name a few. There is also facilities maintenance from outside vendors. Airline hubs also bring in a Federal funds for runway and taxi way improvements, not to mention construction jobs for terminals, hangers and interchanges. Airlines operate on economies of scale. Obviously. Hedging fuel costs offers greater savings when bidding on larger quantities. Bargaining power with aircraft manufactures is also greater. And then there are the labor costs to consider and precisely crew scheduling. Layovers are expensive. Hotel contracts, down-time, legal rest periods and per-diem accounts for the crews. An airline’s scheduling department also has to arrange for sick-calls, leave of absences, vacations and missed connections due to late arriving equipment. The costs associated with crew scheduling can be mitigated when there is a larger pool of crew members to schedule in any one place. It’s not uncommon for an airline to “deadhead” a crew (fly them as passengers) from one base to another simply for the sake of covering a flight that cannot be properly staffed because of local crew shortages. Deadheading costs money and time, reducing the crew’s productivity even further. There were many times when I would deadhead to Atlanta to cover a trip originating 1800 miles away from my home base. There were also times when I would deadhead from Helsinki to New York because the airline had an obligation to get me home in time to fly my next trip – or be at a further loss again. So again, economies of scale. Combining personnel from multiple hubs into one hub creates better staffing options by reducing costs and time. It makes financial sense for an airline to streamline its operations and the most efficient way to do that is to combine multi-hub resources into one location. 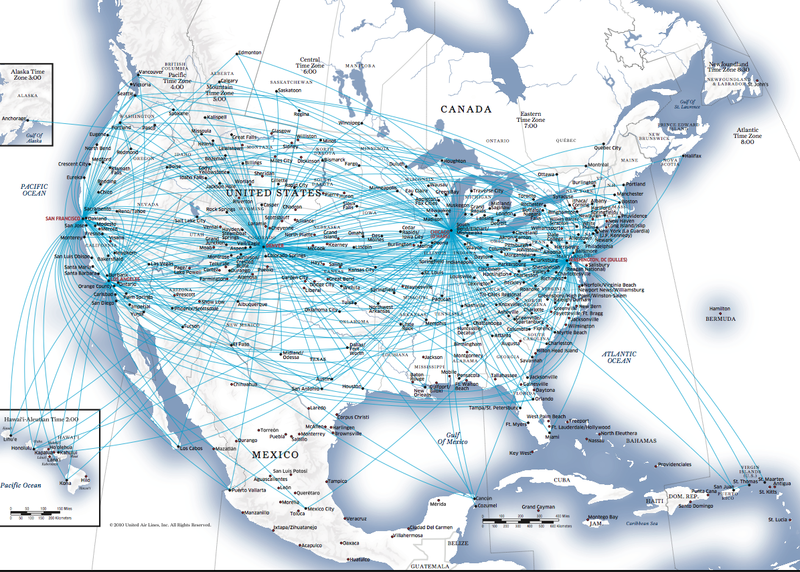 Now, with two mega-carriers (Delta and United) covering the US, Cleveland and Cincinnati become redundant when managing economies of scale. They’re too close to larger hubs and essentially create little, if any versatility for their associated airlines. The airline business is playing itself out as it must to survive and it’s outcome will likely impact Ohio economics. In the mean time the Federal government is offering the State of Ohio funding to create a passenger rail system that some Ohio politicians want to stop. If Ohio’s Cleveland and Cincinnati airline hubs shut down or are reduced to near-nothing capacity and the State of Ohio does not create a passenger rail system, a tremendous amount of national traffic will simply bypass Ohio completely. Understand that one new passenger rail line will not outweigh the job losses at two airport hubs. However, one passenger rail line, a line that starts a larger system, can have an impact on both airports as it connects both Cleveland and Cincinnati. It is far more economical for an airline to rely upon another method of transportation to get passengers from nearby cities into their hubs than it is to fly them there themselves. When I was commuting to Cincinnati while working for Delta, I had a choice of about seven or eight daily flights. Imagine the scheduling requirements of flying an aircraft for less than an hour and less than 200 miles. It’s also fuel-intensive because the majority of the flight time is spent ascending. Imagine the savings in labor costs if those same passengers arrived by rail. Delta would have no costs associated. Amtrak would, of course, but Amtrak is looking for customers and Amtrak can transport them more efficiently with diesel fuel than an airline can with jet fuel. Additionally, bringing passengers into a hub city by train reduces air traffic congestion – adding further efficiencies for the airline. Failure to invest in an Ohio passenger rail system is going to have long-term negative effects for every single resident of Ohio. Our manufacturing base has been reduced dramatically and it could very well be that our service industry falls next should the airlines begin the true consolidation that is needed to make them profitable. The airlines have no allegiance to the State of Ohio. One would expect, however, that it’s politicians would.